# Cut the boned lamb into 8-10 pieces, put in a pot, pour water until it reaches a little higher than the half of the lamb pieces, boil, remove from the stove just before it gets cooked. 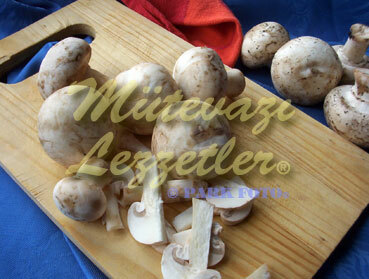 # Cut the mushrooms into a few pieces if they are big, boil with half lemon and some water for 10 minutes. After draining the mushrooms, lay on a medium sized pan. # At first place thickly sliced peppers, then circle type sliced onions and finally the lambs on it, and sprinkle salt and black pepper. # Add about 7-8 tbsp lamb’s boiling water. # Cook in the 374 F oven until it turns red. # Take it out of the oven, sprinkle oregano on it, let it stand for 5 minutes more in the oven. Spread red-hot oil on it. Serve hot. Note: To prevent the mushrooms darken, you should boil with lemon juice.